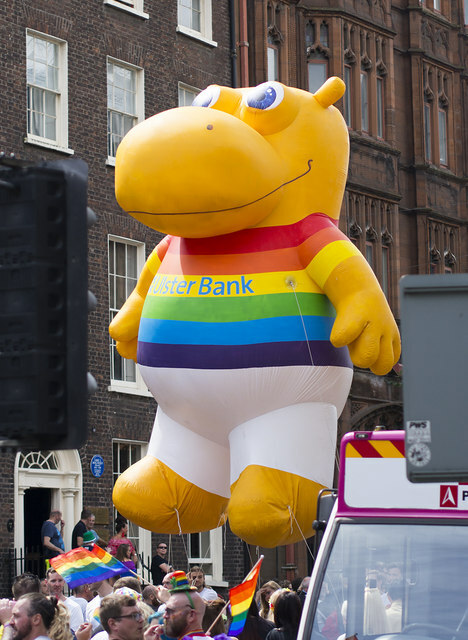 The Ulster Bank's "Henri Hippo" enjoying the parade at Chichester Street. A huge number of companies with offices in and around Belfast took part in the parade. Images of the parade from the 2018 Belfast Pride Festival. "Belfast Pride Festival is one of the biggest festivals in Belfast and runs over 100 events across 10 days. The festival runs from Friday 27th July and will run to Sunday 5th August with Pride Day and the centrepiece Pride Parade on Saturday 4th August.